The Bella Sky Hotel and Conference Center, designed by 3XN Architects, opens next Monday in Copenhagen, becoming one of the largest hotels in Scandinavia. The dramatic twin towers twist and lean as they reach for the sky allowing all of the guests optimal views over the nature park ‘Amager Common’ located nearby. The triangular patterned facade, which may be a little on the wild side, was designed expressly to minimize solar heat gain and maximize energy efficiency. 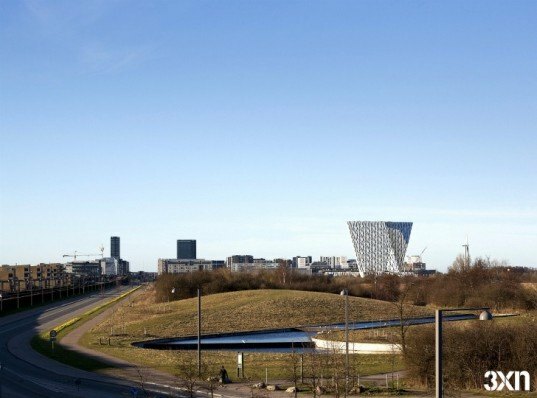 The Bella Sky Hotel is located in the new Ørestad neighborhood and has 814 rooms and 30 conference rooms. Due to a height restriction the building was not allowed to go above 75 meters, so the hotel was designed as two towers to achieve the desired density. Twisting and leaning in order to provide views for the guests, the towers appear as if they are dancing. The towers lean out at a staggering 15 degrees in each direction (11 degrees more than the leaning tower of Pisa), which is making the building an iconic landmark for the area. 3XN designed a large portion of the interior, which was done in a style reminiscent of a tasteful Scandinavian home with warmth, light and a connection to nature. The towers’ energy efficient facade is a mesmerizing pattern of blue glass and white triangles and was expressly designed to be insulated against solar heat gain and heat loss. The hotel also offers electric vehicle plugins for their guests who arrive in eco style, plus they have an overall sustainability plan for running the hotel and hope to achieve an environmental certification in the near future. The leaning idea is being taken one step further with this project, using a vertical variation on a 2nd direction, (looking like being) perpendicular on the 1st which is dominant in the composition. See what has got the leaning(s) started here, at the Puerta de Europa in Madrid, by Pedro Senteri Cardillo & Johnson/Burgee Architects. 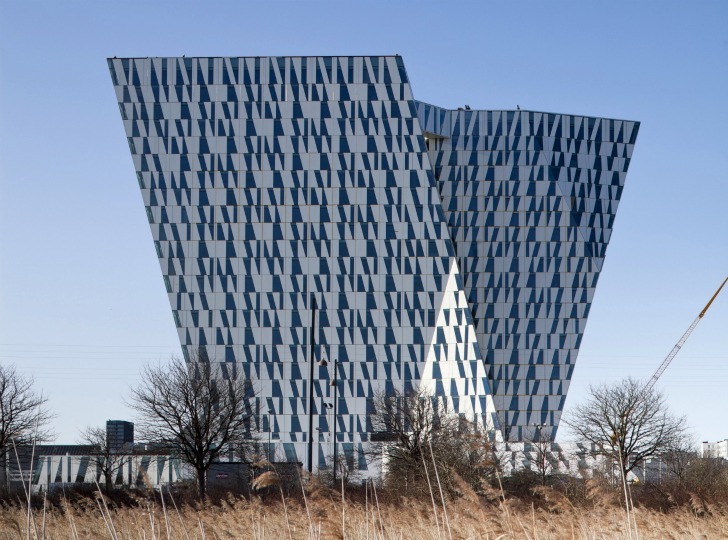 The Bella Sky Hotel is located in the new Ørestad neighborhood and has 814 rooms and 30 conference rooms. Due to a height restriction the building was not allowed to go above 75 meters, so the hotel was designed as two towers to achieve the desired density. To give you an idea of where this is located, you'll notice in the background on the right, BIG's Mountain Dwellings residential complex. Twisting and leaning in order to provide views for the guests, the towers appear as if they are dancing. The towers lean out at a staggering 15 degrees in each direction (11 degrees more than the leaning tower of Pisa), which is making the building an iconic landmark for the area. 3XN designed a large portion of the interior, which was done in a style reminiscent of a tasteful Scandinavian home with warmth, light and a connection to nature. The towers' energy efficient facade is a mesmerizing pattern of blue glass and white triangles and was expressly designed to be insulated against solar heat gain and heat loss. The hotel also offers electric vehicle plugins for their guests who arrive in eco style. They have an overall sustainability plan for running the hotel and hope to achieve an environmental certification in the near future. Concept to maximize views for quests. Concept diagram for tower design.